The excellent Explain XKCD site covers the point of the cartoon. 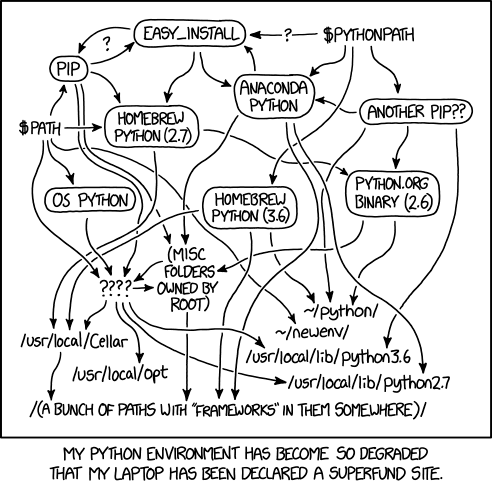 The issue is the (ongoing) difficult transition from Python 2.x to Python 3.x and the reality that there is no defacto package installation tool. The messiness of Python’s development environment deeply contrasts with the cleanliness and beauty of the actual language. One interesting and significant effort in approaching the above issue can be found through the PyPi package manager. A great FLOSS Weekly episode had an interview with one of the maintainers of the new PyPi covering its pros and cons. In the PHP world – Packgist site is the definite destination for third-party PHP packages. In conjunction with these packages, Composer is the defacto package/dependency management tool. It’s more than a package manager because it focuses on managing packages on a per project basis. By default it does not install anything globally. Thus, it is a dependency manager. however support a “global” project for convenience via the global command. Composer’s “global” command installs packages in a common central project and this, in turn, can cause major headaches with projects that have packages installed in different locations. The current solution to this is a Pantheon created tool called Cgr. The blog article provides details on its usage and when to use Composer global. Note: many thanks to the folks on the Poststatus Slack for discussing Composer’s issues and pointing to Cgr.